The Yatra SMART choice property comes with a promise of 8 assured amenities, money-back guarantee and priority helpline support. You also get free cancellation and standardized prices through the year. 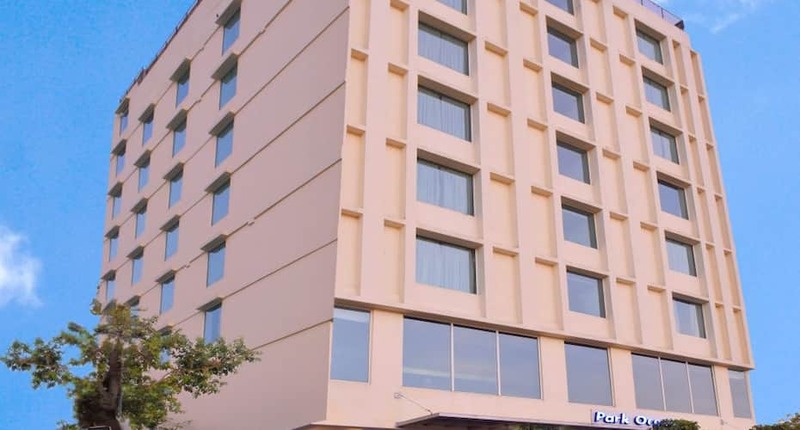 Hotel Park Ocean is located at a distance of 15 km from Amber Palace and 17 km from Jaipur International Airport. This hotel in Jaipur has free Internet and free breakfast service. It comprises of 48 comfortable and spacious rooms spread across 9 floors. It is well-equipped with modern amenities like tea/coffee maker, mini-bar, wake-up calls on request, welcome amenity, air-conditioner and wardrobe. It has an attached bathroom with 24-hour hot and cold running water and toiletries. This hotel in Jaipur offers laundry, medical assistance, 24-hour front desk with express check-in/check-out facility and room service. This property has coffee shop, bar, spa, swimming pool, banquet hall, conference room, luggage storage, travel counter, backup generator and currency exchange. Hotel Park Ocean has an in-house and open-air restaurant that serves variety of delicacies. This property is 5 km from the Jaipur Railway Station. Some of the tourist attractions are Shish Mahal (14 km) and Govind Devji temple (8 km). Full refund if you cancel this booking by 29-Apr-19 12:00 PM IST. First night cost (including taxes & service charge) will be charged if you cancel this booking later than 29-Apr-19 12:00 PM IST. Mandatory New Year Eve gala dinner charges 2000/- AI per person & 1500/- AI child above 8 years directly payable at Hotel. Reason For Rating : Nice staff.........rooms are clen and comfy. Most important washrooms are neat clean. Located at nice place and ambience is also good. Food quality is awesome. We stayed two nights. We ordered dinner and my daughter ended up with food poisning. The room was very dim the lights needs to be more bright and breakfast the bread was Very hard and stale. I did not think very much of this hotel. The hot water was not working and it is needed after a long day. If this hotel will be sold as a 3 star hotel, it is a great property, worth every penny; but from a 4 star hotel, you expect more and in this department it fall sort of my expectation. From pictures it looked quite different, but i was unable to find out from where that photo was taken. It has a small building, almost no reception area accept for a counter and sitting area for 8-10 people. On the better side, the rooms are quite good in taste and in decor. Club rooms are specially spacious and has a nice view. sleep quality is good but in the name of toiletries there was nothing except a small soap and shampoo. apart from that the bathroom was good. Food served in the first floor restaurant was very tasty. we tried many things in buffet and found almost everything worth a try. This hotel has a swimming pool too on 8th floor. Location of the hotel is also a little bit away from city center. staff was quite helpful. Overall, do not expect a 4 star and you will be happy. We stayed here for 2 nights . It was a great stay. The rooms are clean and service is very nice. Food -lot of variety and delicious.they will serve freshly prepared. In case you need additional to buffet menu they will serve hot within short time. A special thanks to manager at restaurant, he is very nice person. Thanks a lot for making our stay memorable. Good Budget Hotel to Spend your Week End. Location is Superb, Open Green Ground in Front of Hotel and Nearby Tourist Market of Bapu Bazar. Have good Hospital facility nearby and Have a Cheap but Clean Rajasthani Dhaba (Shiv Dhaba) nearby which serves you Authentic Rajasthani Food (except Dal Bati.) Staff is Good and Cooperative. Overall Rating is 4/5 Except for Limited Parking Area which takes around 10 min for the Staff to bring your car to Frent Desk. Stayed for 02 Nights and had a wonderful experience the rooms were nice and spacious, food was great, Breakfast layout was good. We had a DJ party organised at the Roof top with bonfire and Bar Be Que snacks had a great time. The have a nice pool on the roof top as well. The owner Mr. Sandeep is personally involved in all operations. club room is spacious and has a nice view but they are expensive too. front view super deluxe rooms little costly but have very good front sunset view.